Der vorliegende Doppelband behandelt ein zentrales Thema der österreichischen Geschichte des 19. Jahrhunderts. Die ersten Beiträge belegen die politischen Bemühungen, eine dem so heterogenen Vielvölkerstaat angemessene Lösung des Verfassungsproblems zu finden und gleichzeitig den Weg in Richtung Demokratisierung zu beschreiten. Besonderes Interesse darf die Darstellung des ungarischen politischen Systems beanspruchen, schon allein deshalb, weil es kaum eine neuere Darstellung gibt, die so kenntnisreich den Weg von der „historischen” in eine neue, liberal orientierte Verfassungsordnung beschreibt. Die folgenden Beiträge sind der eigentlichen Parlamentsgeschichte gewidmet. Als Ergebnis einer nicht nur auf den Nationalitätenstreit fixierten Betrachtungsweise ist festzuhalten, daß sowohl der österreichische Reichsrat als auch der ungarische Reichstag von Anfang an eine bedeutende legislatorische Tätigkeit entfalteten, die vielfach tiefgreifende Modernisierungen und materielle Fortschritte bewirkten. Anders als im ungarischen Reichstag fanden im Wiener Reichsrat bis 1914 neue, bislang nicht vertretene Kräfte ein Artikulationsforum. Die Darstellung des damit einhergehenden Wandels der parlamentarischen Fraktionen und Parteien, ihrer Handlungsspielräume und Strategien beschließt den zweiten Hauptteil. Der spezifische Charakter der „Doppelmonarchie”, ihre (quasi-)parlamentarischen Institutionen und ihre staats-und völkerrechtliche Problematik stehen im Zentrum des dritten Hauptteils, wobei insbesondere der Beitrag über die „Delegationen” wissenschaftliches Neuland erschließt. Ein Novum stellen ferner die Tabellen und Karten zur Reichsratswahl 1897 dar, deren kurienweise Darstellung von Wahlberechtigung, Mandatsverteilung und Wahlergebnissen erst die Komplexität des cisleithanischen Wahlrechts veranschaulicht und die Basis für die im Text gebotene Interpretation dieser Faktoren und ihrer Wechselwirkung liefert. The previous volume in the series "Die Habsburgermonarchie 1848-1918" dealt with political elites as seen in constitutional questions and the history of parliamentary institutions. The current volume looks at the degree of democratization of this period in the social spheres and processes that were outside constitutional issues and parliamentary sittings. The "politicization of masses" took place in political and cultural environments outside organized politics and was dominated by associations and local organizations primarily held together by the local press. Activists from steering committees of such associations and from editorial offices were responsible for the transformation of the traditional bureaucratic-feudal state to a peoples civil state. Associations, political parties and a large quantity of printed material provided the "school" in which ordinary people learned what was required for political action. Twenty-eight authors from ten different countries have investigated this development in Eastern Central Europe ("Mitteleuropa"), an area socially and culturally highly diverse. About 2,800 associations from all parts of the Habsburg Monarchy have formed the basis for these studies (listed in a separate index at the end of Part 2). In 1910 over 100,000 associations existed in Cisleithania alone. In addition to associations that were purely political, there were many other types of associations, including cultural, student, confessional, singing, sports, and vocational, as well as associations promoting economic progress (all of which could be used for political purposes and often were). As the activities of most of these associations (whose members numbered from a mere dozen to several hundred) were mainly local, the articles in this volume are organized according to region. However, attention has also been given to bodies whose activities covered a much wider area and that represented broad economic, cultural and political interests (including the feminist movement). Even if one considers the unequal levels of development in different areas, which slowed the acceptance of general trends because of local circumstances, some general trends are nevertheless visible throughout the Habsburg Monarchy. Associations changed from being a place for citizens to deliberate political, cultural and economic questions (including emancipation of the underprivileged) to all-encompassing political factions. The ideological, national, and vested interest cohesion of these factions varied in the different parts of the Habsburg Monarchy. As a result, in the years before the First World War, the political landscape in Bohemia and Galicia was quite different from that of the German-speaking Alpine and Danubian areas. 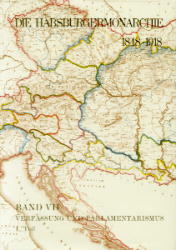 The large number of associations played a vital role for increasing political participation, but also mirror the rise (seen in other fields as well) in tendencies of disintegration within the Central European society (or societies) and the rejection of the supra- and trans-national order supported by the Austro-Hungarian authorities.